Grapes and Gusto™ | Gilat Ben-Dor · Summer Picnic Wines: Sauvignon Blanc and the Colonel? Summer Picnic Wines: Sauvignon Blanc and the Colonel? Yin and Yang in the mouth: the Colonel would be proud. This is the first installment of five food and wine “picnic pairings” in a series, spawned by my latest appearance on Arizona’s “The Pat McMahon Show” (AZTV) earlier this week. I set up a spread of classic picnic fare and paired wines with them that will make both food and drink POP. Today, let’s take a look at the first pairing: Sauvignon Blanc and mmm-mmm-good friiiiiied chicken! Fitness trainers be darned, I just love this sinful version of crispy, fatty goodness, a burst of seasonings enveloping juicy poultry (if done right). The light-bodied, crisp Sauvignon Blanc has long garnered its own series of classic pairings – mild seafood dishes, lemony vinaigrettes and, a real classic, goat cheese. Those would all be considered to be complementary pairings, as they emphasize a “like-with-like” combination of playful tartness. 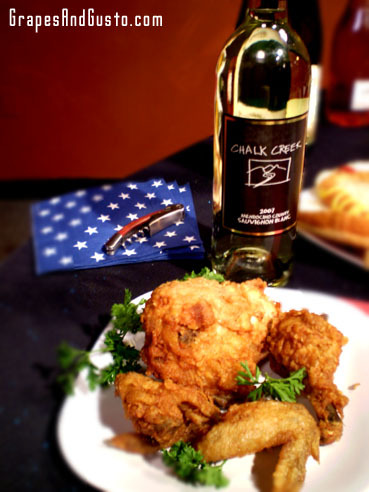 But here, in the realm of the down-home and juicy, I like to employ a contrasting approach: by sipping the Sauvignon Blanc alongside the heavier, oily fried chicken (or any fried food, for that matter), the wine’s piercing acidity will cut through the grease and impart a zingy, refreshing taste – like a yin-yang experience in your mouth. Try this with some creamy picnic favorites, like potato salad and macaroni salad, for more of that zesty contrast. Good examples: St. Supery Sauvignon Blanc 2008 (Napa Valley, approx. $22), Sauvignon Blanc from the Sancerre region (Loire Valley, France, prices vary); Value Pick: Falling Star Sauvignon Blanc-Semillon 2008 (Mendoza, Argentina, $6).